Most of the small towns we have visited in the Pampas are doing well. There’s attractive new housing. The communities are safe. A high percentage of high school graduates return to their home towns after completing their tertiary (post high school institute) or university studies. 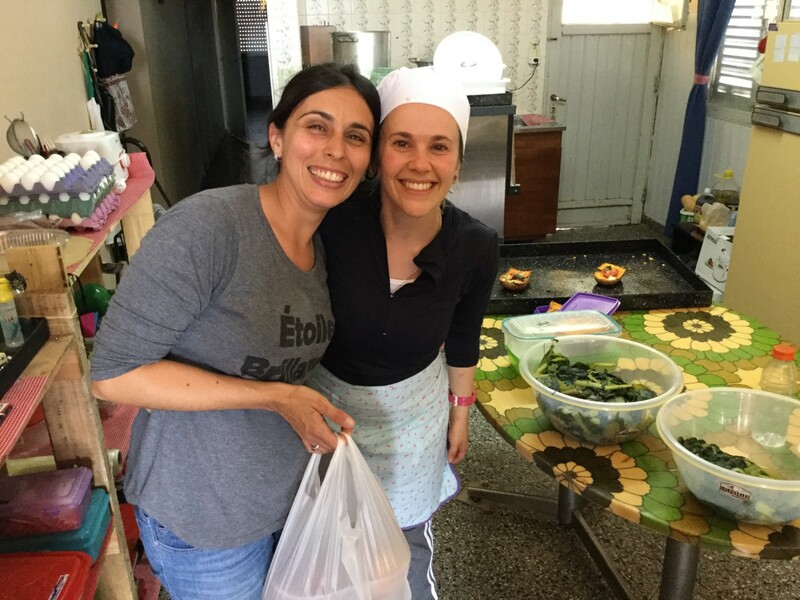 Some even start their own businesses, like Natalia and Antonela, the two young women pictured below. About six months ago, they set up a take-out business. They use WhatsApp to distribute their daily menu. Anto’s degree in nutrition has served her well. When we visited, they were doing a brisk business. So, what lies behind the economic health of the Pampas? Agriculture. The Pampas is flat with rich soil. Farmers rotate crops every several years to protect against soil depletion. What do they grow? Corn, wheat, sorghum and soybeans. But the real engine behind the agricultural economy is dairy. 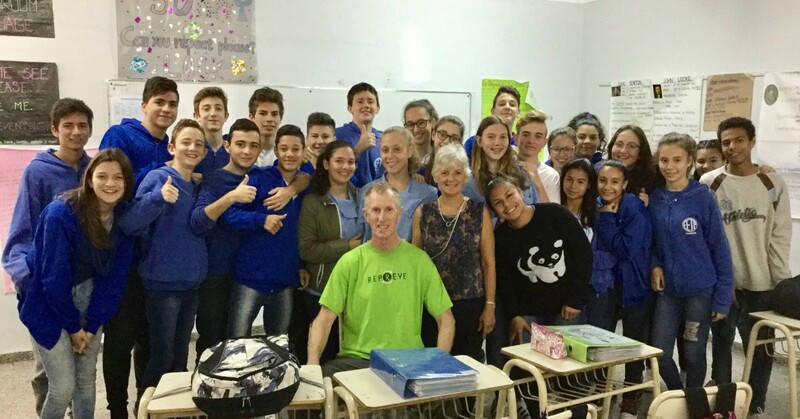 Early in our stay, we had the opportunity to visit and speak with the students and staff at the technical high school at Franck, a town of some 6,000 people. Our stereotype of technical schools is that they are light on academics and heavy on hands on experience. Not so here. Take a look at the picture below. 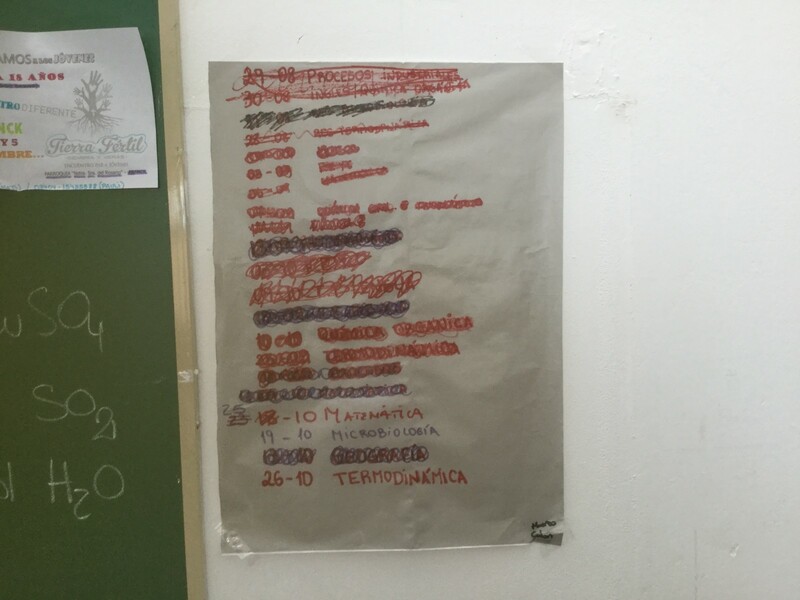 It’s a list of the exams which the students have taken this semester. Among the crossed out topics are physics, organic chemistry and inorganic chemistry, a course feared by pre-med students in the States. And the upcoming tests? Math, microbiology and thermodynamics. The school is located across the street from the huge Milkaut plant, which employs over 1,000 workers. 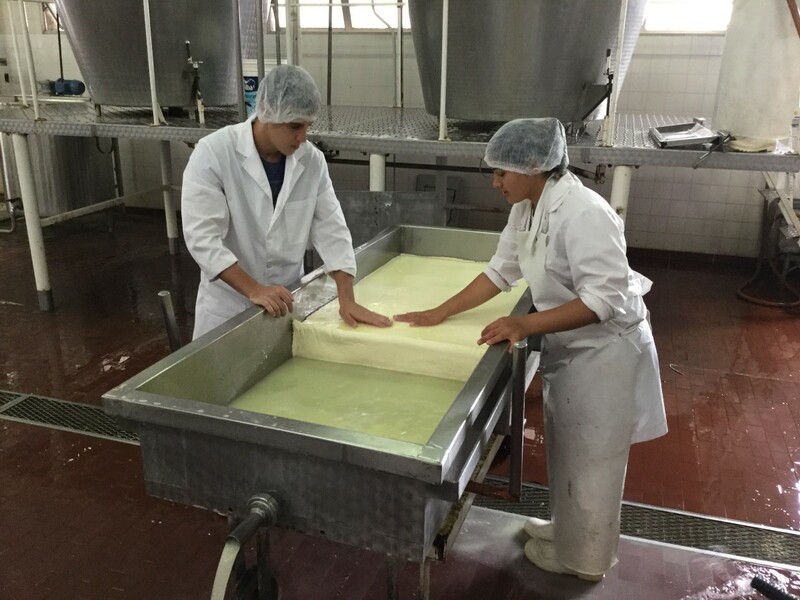 Milkaut produces milk, cheese and other dairy products including dulce de leche, a thick sweetened milk product with a caramel like flavor. It’s not only used in desserts but is also a popular ice cream flavor. 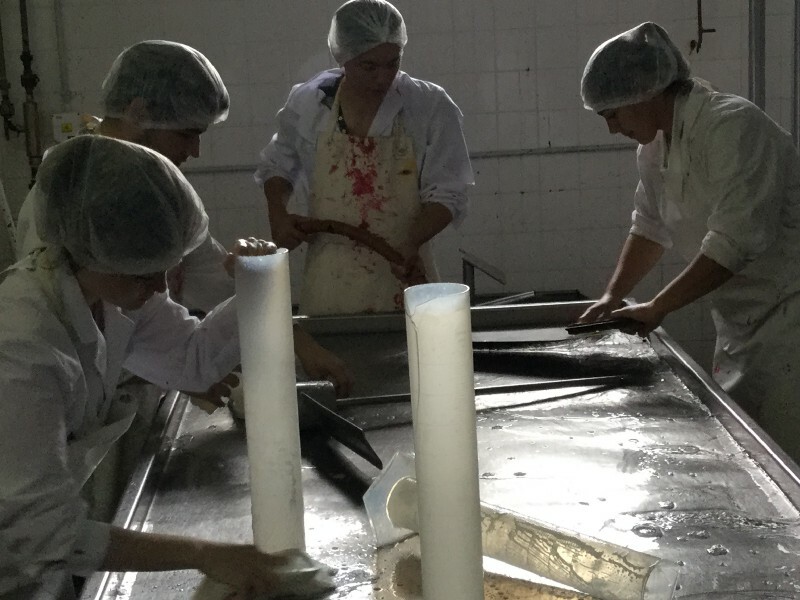 To run the factory, Milkaut needs not only line workers but also engineers to run the plant, technicians for quality control and skilled production workers. 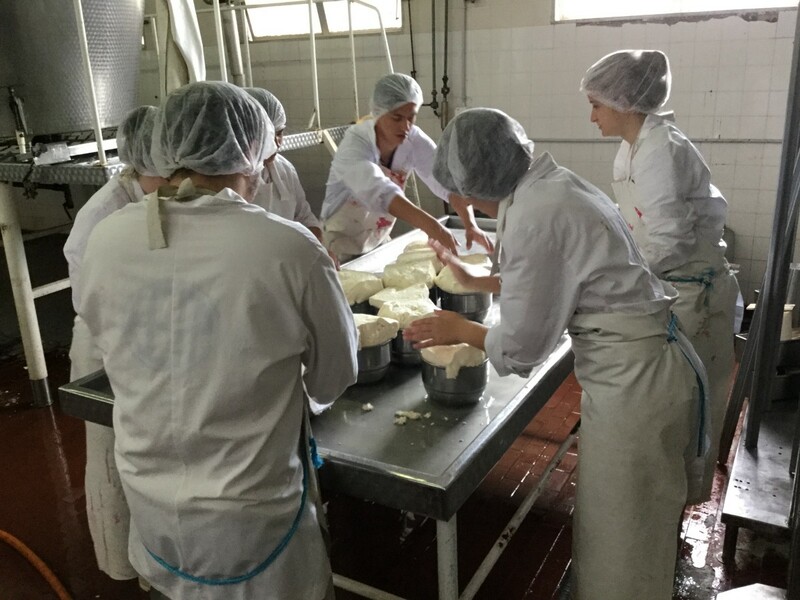 To insure a ready supply of such a labor force, Milkaut diverts some of its milk to the Franck technical school. 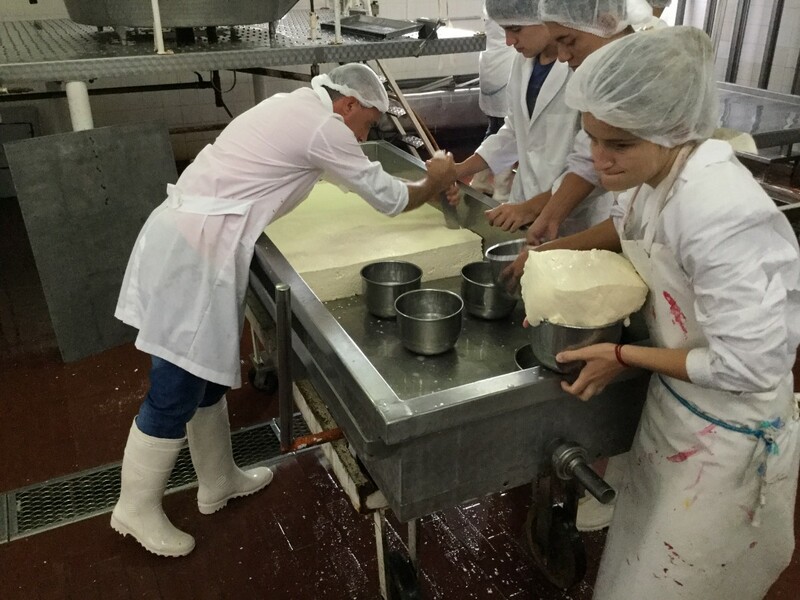 There, under the careful tutelage of their teacher Martin Vicentin, the students produce cheese using traditional artisinal methods. The milk comes pouring out of the huge elevated vat. 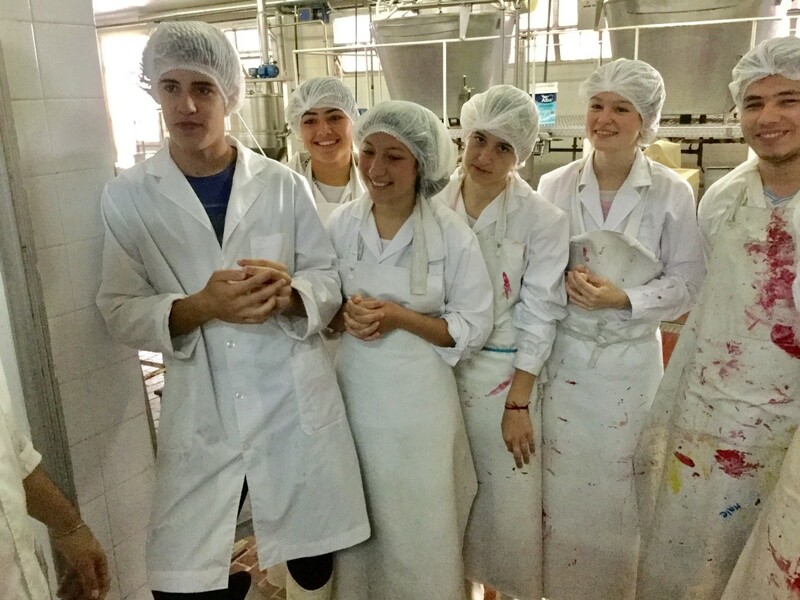 The students use cheesecloth to filter the product and tubes to isolate the cheese. 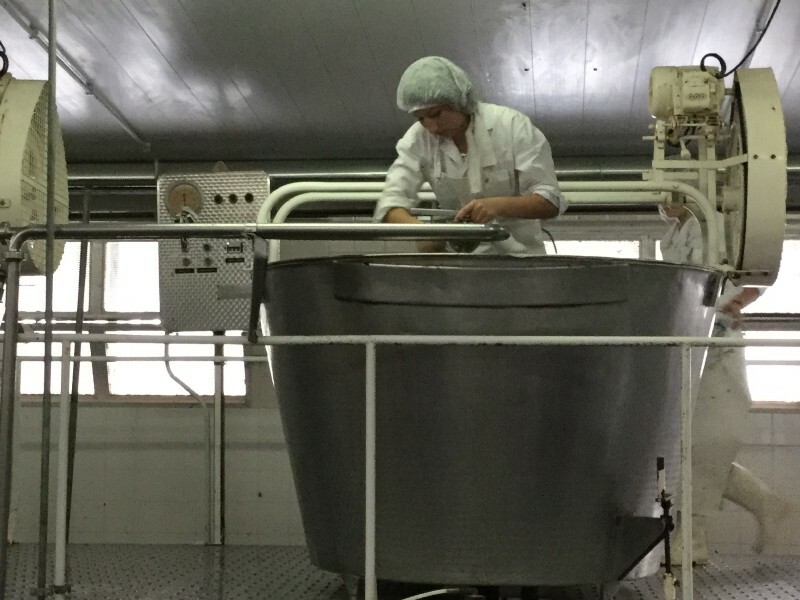 The whey is drained off into tanks and later returned to the farms, where it’s mixed with grain and serves as animal feed. 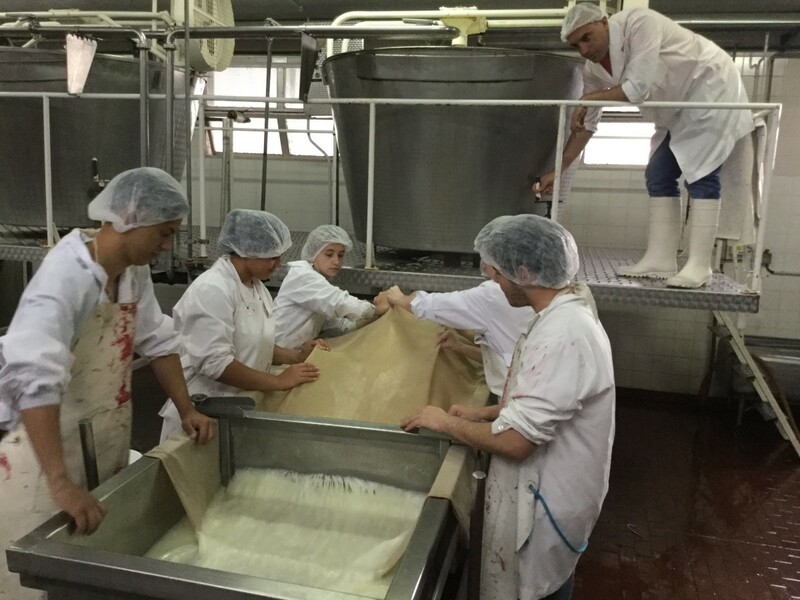 The cheese is formed into a huge rectangle. Chunks are taken out and stuffed into molds. 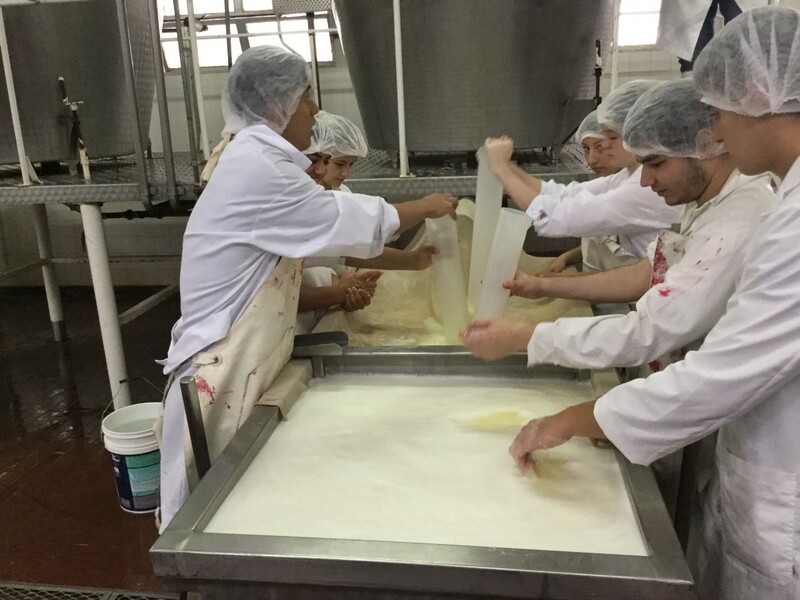 The work area, including the vat, is then cleaned by the students. 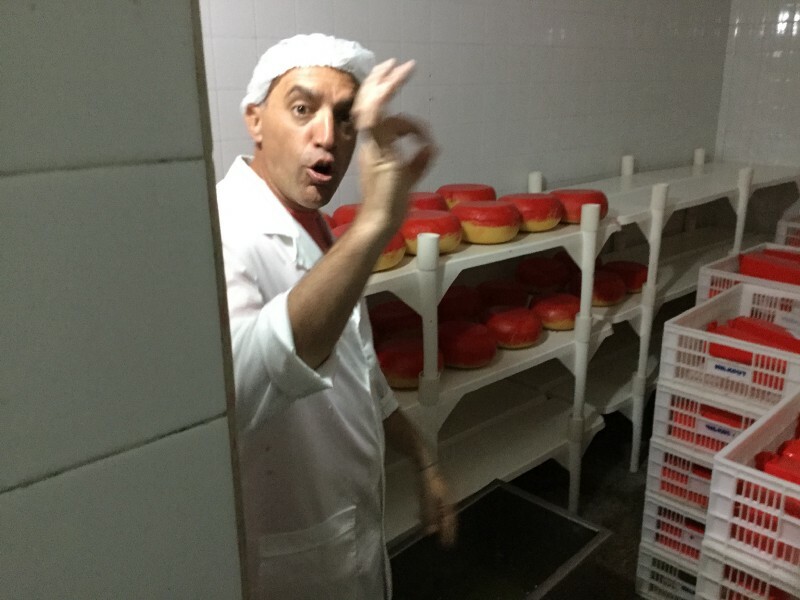 What happens to the cheese? It’s taken to a refrigerated room for aging. Some of the final product is sold by the school. Some is transferred to Milkaut for sale. About a month after visiting the technical school in Franck, we toured a tertiary school in the pueblo of St. Guillermo (St. William). (Tertiary schools are post high school institutions which have 2–3 year courses of study). The school serves three populations. In the morning, it’s a secondary school. In the afternoon, it functions as a kindergarten and primary school. At night, from 6 pm until 11 pm, it is a tertiary school. Like many schools in this area, the St. Guillermo school is a church/state venture. It was started by a group of of Dominican nuns. Their convent remains near the school, but they are down to only two nuns, one who’s 56 and the other who’s in her nineties. The facility is owned by the Dominicans but funded by the state. Its religious roots are still present, as evidenced by the school’s chapel. The St. Guillermo school is not located next to a milk plant. 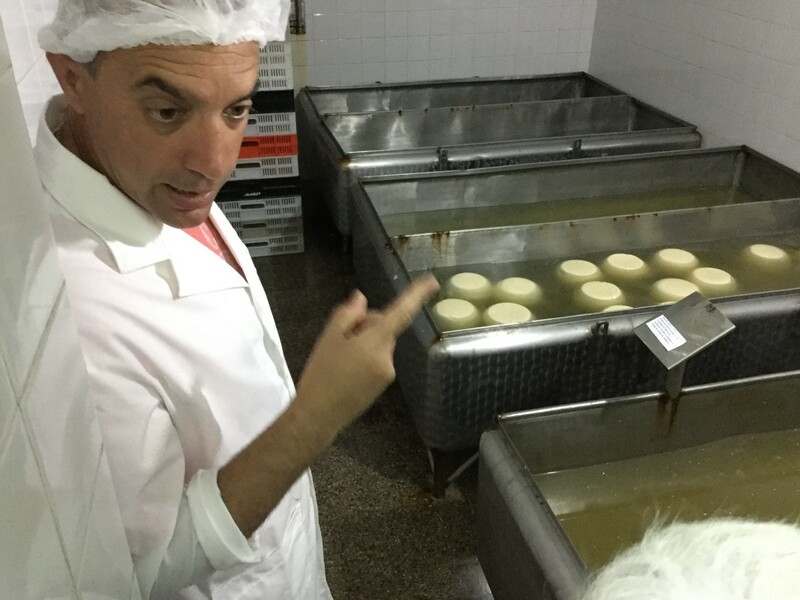 It does not have a cheese making facility. 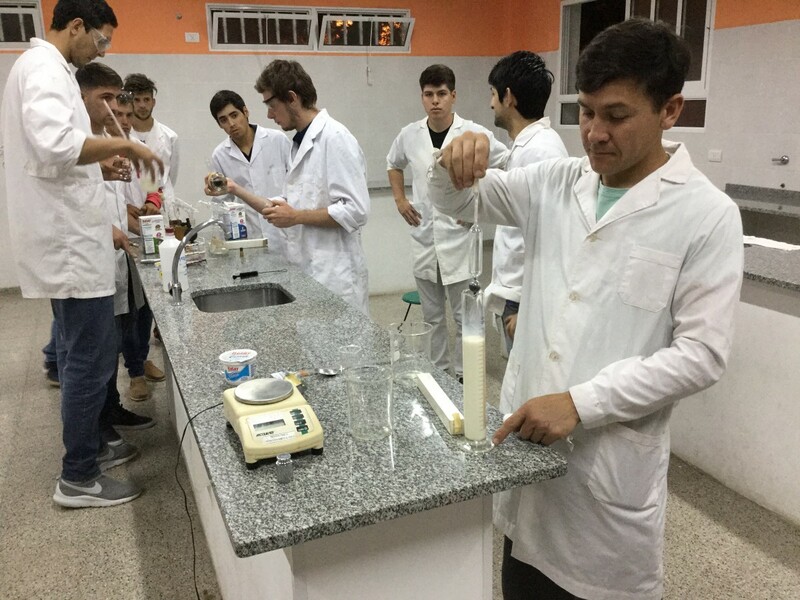 The students spend several years learning the science behind milk production. They carry out tests to measure the fat content, protein level and bacteria count in milk. There is an autoclave. There is a centrifuge. The place is spotless. Look at the photos above. The one on the left is from the Franck school. (The red stain on the student’s work clothes is from the cheese casing). The one on the right is from St. Guillermo. Do you notice any differences? Yes, students on the left are younger. But there’s something else which sets the two apart. The Franck students are a mixture of young men and women. The St. Guillermo students are all men. 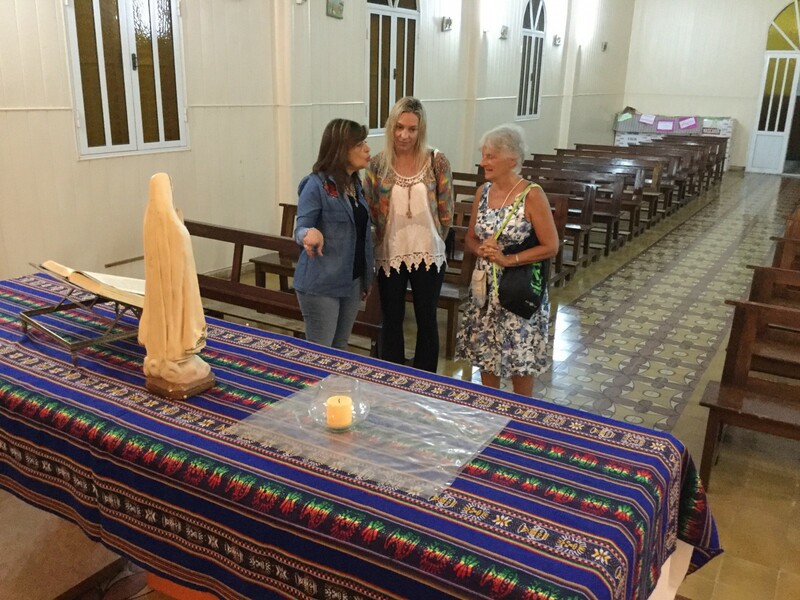 St. Guillermo is located in a more rural part of Santa Fe Province, some three hours from Franck. Franck is situated near the capital city. This might explain the difference, but I really don’t know. So where does all this milk come from? 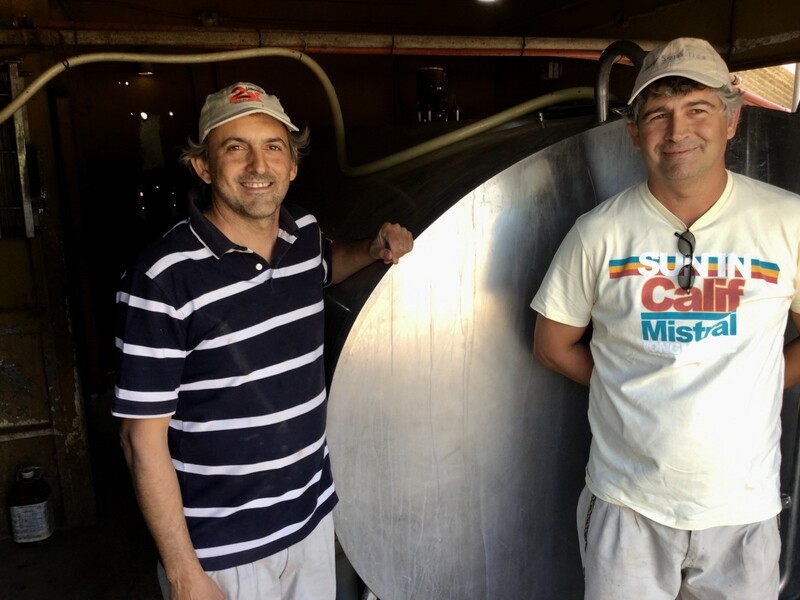 Well, from family farms, like the one run by brothers Pablo and Diego, pictured here in front of an 8,000 liter milk tank. 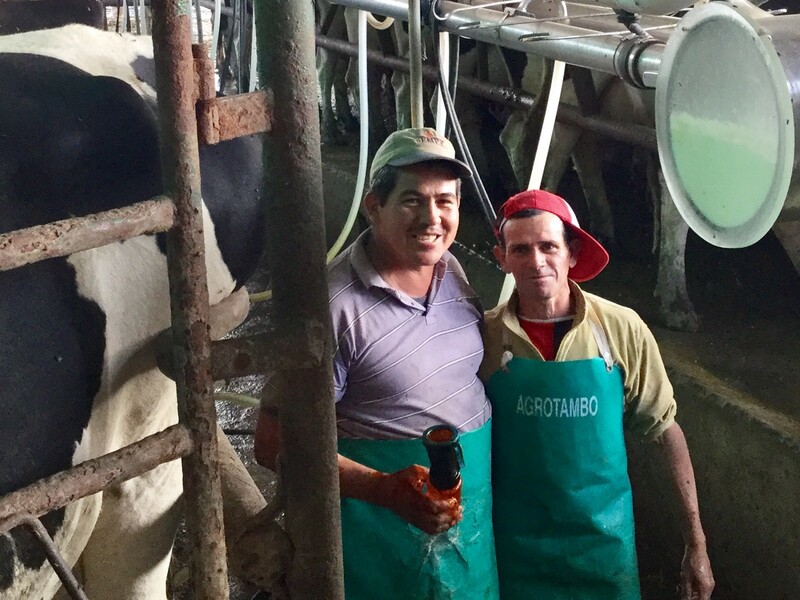 Pablo and Diego are the third generation running this farm. Their grandfather founded it. Their father and their uncle ran it before them. 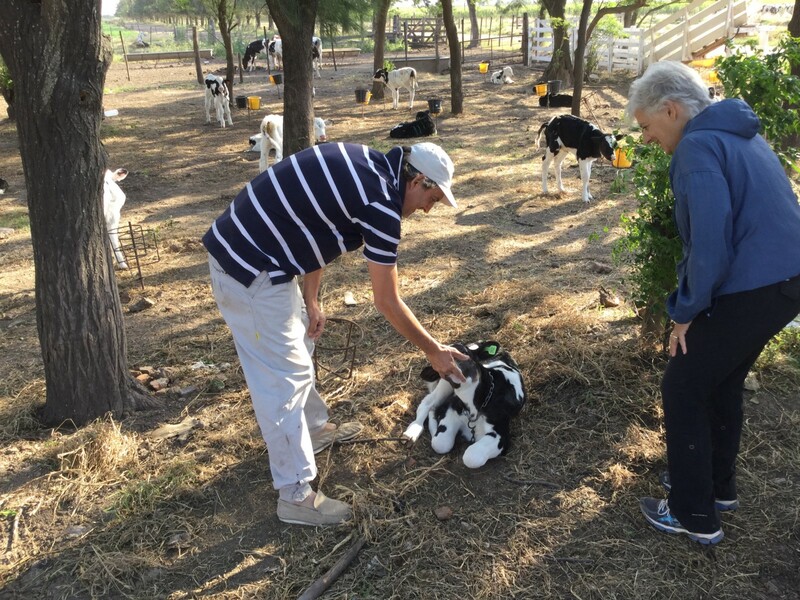 The farm has hundreds of acres devoted to raising crops and cows, the latter for both dairy and meat purposes. They also rent a large amount of acreage from another family in Suardi. The setup is as follows. The brothers raise wheat, corn, sorghum and soy. 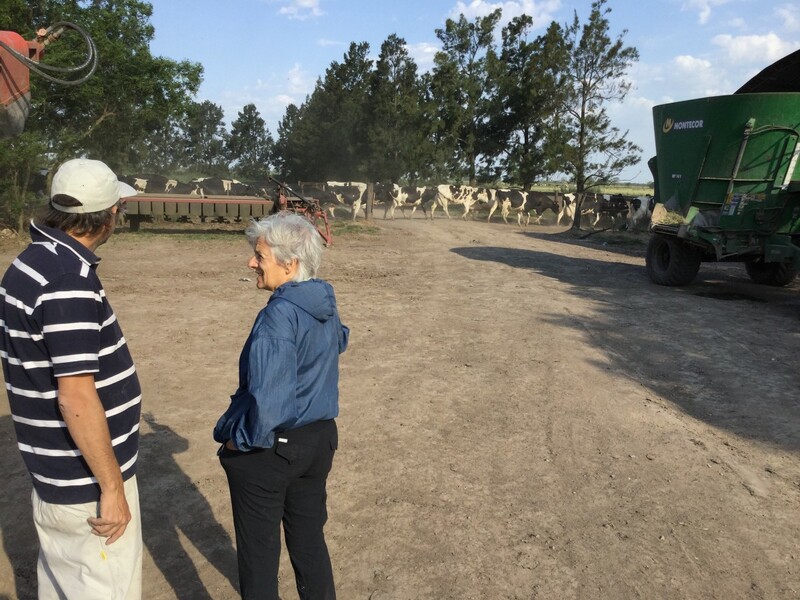 After it is harvested and processed, it is mixed with cottonseed and fed to the cows. (See the vat below). The farm has several “small” milling machines, including the green behemoth lurking in the background, below on the right. There are six families living on the farm and anywhere from 6 to 12 employees. Pictured below are some of the workers. There are two cement rows in the milking shed. The process of hooking up the cows to the milkers and extracting the milk takes about ten minutes. The cows eat during the milking process; it helps them relax and eases the flow of milk. The shed holds 28 cows. Afterward being milked, the cows shuffle out in a surprisingly docile fashion. Sort of reminds me of the Carnation condensed milk slogan — Made from Contented Cows. The cows are impregnated once a year. About 200 of the resulting calves survive. Those pictured in the foreground below are 1–2 weeks old. It takes a lot of patience to run a dairy farm. The cows are not impregnated until they are 18 months old. Gestation takes nine months. So, at the earliest, the cows do not start giving milk until they are 27 months old. Cows which do not conceive after three attempts are sold for meat. (That strikes me as a strong incentive for conceiving, not that the cows’ mental frame of mind has anything to do with it). This area of Santa Fe Province has periodic electric outages. The longest one during our visit occurred when an 80 year old pilot crashed his small plane into major electric wires. The pilot died, as did the power. Power was out for a day. (The Spanish expression is “No hay luz,” which translates into “There is no light.”). Even after power was restored, it sporadically went out. To cover such contingencies, the farm has back up generators, so that the milk remains at a proper storage temperature. The generators do not run by themselves. Rather, they are hooked up the utility driveshaft on the tractor. Then you have to make sure that you have enough gasoline on hand so the tractor does not shut down.. This is a substantial economic operation. There is a huge capital investment in equipment — huge disc plows, planters, mixers, mills, tractors and the like. There are the utility bills, payments for supplies, wages paid to workers, etc. As with much of the land in Santa Fe Province, the water aquifers contain a significant amount of arsenic, so it cannot be used for irrigating crops. Rather, farmers must rely on Mother Nature to supply enough water to sustain the crops. Pablo voiced concern that the lack of rain this spring (remember, this is the Southern Hemisphere) was stunting the growth of the corn. 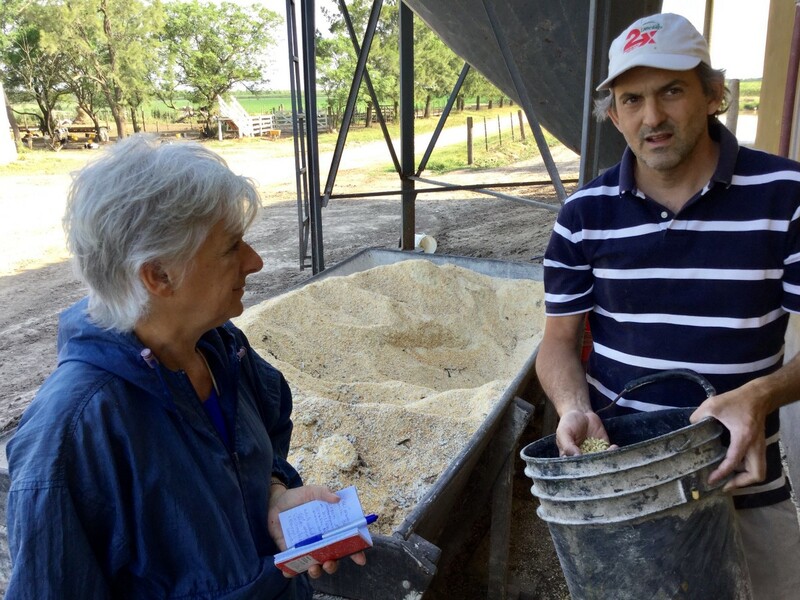 The brothers’ farm business turns out 14,000 liters of milk each day. There are three large companies which buy the milk. Currently, they’re paying 5.75 pesos (about 29 cents) per liter. The milk ends up being sold in the stores for 25 pesos ($1.25) a liter. So, the farmer takes in less than 25% of the final price of the milk. And what kind of milk do Pablo’s children drink? Not fresh milk, but rather powdered milk, made from contented cows.